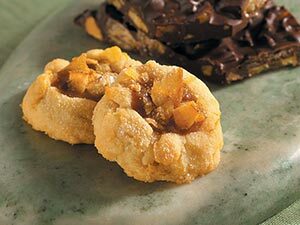 Fresh-baked cookies are a surefire way to captivate customers with a small indulgence. Crushed potato chips give this recipe an on-trend sweet-salty flavor profile and a pleasing crunch. The caramel dolloped on top provides creamy contrast. 1. In medium bowl, cream butter and 3 1/2 ounces sugar until fluffy. Add pinch of salt and vanilla’ mix well. Stir in 2 cups potato chips and mix until combined. Wrap dough in plastic wrap and refrigerate until firm, about 1 hour. 2. Preheat oven to 350 F. Line baking sheets with parchment paper. Scoop dough onto baking sheet and roll each scoop into small ball, leaving a 2-inch space between each cookie. Press thumb in center of ball, creating a thumbprint. Bake until cookies are golden brown, about 8 to 10 minutes. Remove to wire racks to cool. 3. To make caramel, combine 6 ounces sugar, corn syrup and 1 teaspoon salt in a heavy-duty saucepan. Cook over medium heat until medium amber in color. 4. Meanwhile, in small saucepan, heat cream to warm. When sugar is medium amber in color, return to a boil before stirring in remaining sugar. Add warm cream in small batches, reducing after each addition. Remove saucepan from heat and reserve to cool. 5. To assemble, put a dollop of caramel in center of each cookie. Refrigerate to set caramel. Sprinkle remaining crushed potato chips on top of caramel, and dust lightly with confectioners’ sugar.